"The way I see it, we've got what, we've got 650 years of knowledge on these guys. If we put our heads together, there's no reason why we shouldn't be able to get out of here and home in 20 minutes," Chris Johnston (Paul Walker), noting the advantages of being a citizen of 2003 trapped in the year 1357, in the 2003 film, Timeline, based upon the 1999 novel of the same name by Michael Crichton. How's that for chronological snobbery? 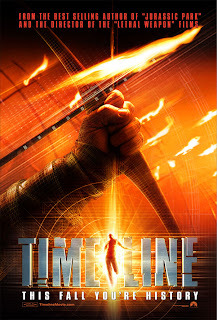 Would that time travel were possible; cinema-goers could travel back to 2003 and prevent the production of the uninspiring time travel movie, Timeline, based upon Crichton's novel but mostly cinematic cliches. 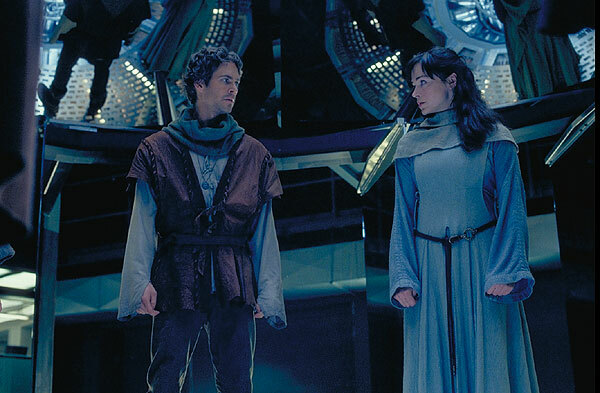 Above: Chris (Paul Walker) and Kate (Frances O'Connor) prepare to go to 1357. The film's plot is relatively straightforward. Archaeologists working a dig at Castlegard, France make a curious discovery in a medieval monastery. In a room no one has visited in six centuries, they find a modern bifocal lens and a written plea for help from the dig's leader, the missing Professor E. A. Johnston (Billy Connolly), apparently trapped in the year 1357. To investigate, Johnston's team, comprised of his son Chris and archaeologists Kate Ericson (Frances O'Connor), Andre Marek (Gerard Butler), François Dontelle (Rossif Sutherland) and physicist Josh Stern (Ethan Embry), travels to the headquarters of ITC, the company has been funding their project. Thereupon, ITC officials admit that they inadvertently discovered a wormhole which can transport people directly to Castlegard in 1357. Professor Johnston chose to venture back to the past and has remained there long enough to lose his ability to return. So, of course, his team opts to travel back to the past to retrieve him and return him to 2003. What makes a proper time travel movie worth its salt is the presence of anachronisms, or depending on the nature of the story, parachronisms. Directed by Richard Donner, with a script by Jeff Maguire and George Nolfi, the film simply cannot capitalize upon its premise. Upon traveling back in time six centuries, the characters refuse to take meaningful advantage of their anachronistic knowledge and skills; they make but a few amusing remarks about what they observe in the past. So busy are they being chased by villains that the movie becomes just another a tired formulaic action picture which just so happens to feature time travelers. Marek: Are you, uh... married? Lady Claire: No. We've been fighting the English since before I was born. There's no time for marriage. Marek: Of course. Are you, uh... with... anyone? Lady Claire: Am I with anyone? Lady Claire: I'm with you. Marek: I know, I know. What I mean is, is there, is there someone, is there someone... that you see? Lady Claire: Do I see? Lady Claire: [Looks around] Uh, nobody... It is possible they are hiding on the shore or... in the woods. They could be anywhere. Marek: We're speaking the same language, but you don't understand a word I'm saying, do you? 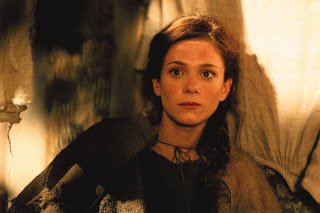 Lady Claire (Anna Friel) endures the past, as we all must. Most irksome, the theory of time travel set forth in Timeline is inherently inconsistent. On the one hand, the narrative suggests that the past cannot be changed, i.e. what is history will always be history and any interlopers from the future may only set in motion events which already occurred. In one early scene, Erickson, working in the present day, uncovers an apparently intentionally damaged mural in the ruins of the monastery and inquires what sort of a person could have perpetrated such wanton destruction. Later, in 1357, as she attempts to uncover a secret tunnel from the monastery to a nearby castle, Erickson learns that it was she herself, this time in the distant past, who destroyed the mural in the climax of battle, bringing about her own observation centuries later. In another early scene, Marek, in the present, uncovers an unusual sarcophagus which, among other things, features a carving of an occupant, who apparently lost an ear at some point during his life. Later, after being hurled into the past, Marek loses an ear in a melee and realizes that it is his destiny to remain in the past and later occupy the stone coffin. ("It's me, it's me!" he exclaims upon losing his ear.). Upon returning to the future, Marek's friends find the inscription on the sarcophagus, which confirms that it was indeed that of him. 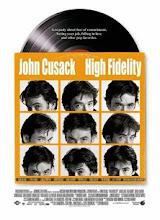 However, the film contradicts itself when it decides that history can indeed be changed. Much ado is made of a battle between the French and the English, who are holding a French fortress at Castlegard on the very day the time travelers arrive. Apparently, as history originally recorded the battle, the English were overpowering the French until the English made the fatal mistake of killing Lady Claire and hanging her body from atop the fortress. This act, according to dialogue-as-exposition at the film's beginning, galvanized the French forces and ultimately resulted in the French victory and the destruction of the fortress. However, as the film progresses, Lady Claire's originally fate is forestalled by Marek, who saves her life and therefore changes history. Marek remains in the past, marries Lady Claire, has children with her, and their undying affection ends up as the art carving on the aforementioned sarcophagus. (Is a sarcophagus the best way to symbolize undying affection?) Yet the sarcophagus remains as it was at the beginning of the film, in the timeline in which Lady Claire died during the battle. 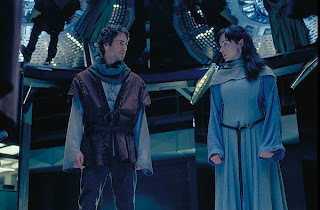 All of the evidence of their romp into the past was present in the archaeological record at the beginning of the film and before their trek, which nicely implies fate and that time travel is proof of predestination. However, the initial historical accounts of the battle cannot be reconciled with what actually occurs at the film's climax. Pick a theory, Timeline, and stick with it.